Pope Francis would like to see an ‘opening’ on church teaching on divorced and remarried according to Cardinal Walter Kasper. Pope Francis is to establish a special commission to look at reforming the annulment processes in canon law. The decision was made at the beginning of August and announced on Saturday. The new committee tasked with revising matrimonial processes in canon law will be chaired by Mgr Pio Vito Pinto, Dean of the Roman Rota. According to Vatican Radio, the work of the Commission will start as soon as possible and will prepare a proposal for the reform of the matrimonial process, with the objective of simplifying its procedure, making it more streamlined, and safeguarding the principle of the indissolubility of matrimony. The other members are Cardinal Francesco Coccopalmerio, President of the Pontifical Council for Legislative Texts; Archbishop Luis Francisco Ladaria Ferrer, SJ, secretary of the Congregation for the Doctrine of the Faith; Bishop Dimitri Salachas, Apostolic Exarch of the Greek Byzantine Catholic Church; Mgrs Maurice Monier, Leo Xavier Michael Arokiaraj and Alejandro W. Bunge, Prelate Auditors of the Tribunal of the Roman Rota; Fr Nikolaus Schöch, OFM, Substitute Promotor of Justice of the Supreme Tribunal of the Apostolic Signatura; Fr Konštanc Miroslav Adam, OP, Rector of the Pontifical University of St Thomas Aquinas (Angelicum); Fr Jorge Horta Espinoza, OFM, Dean of the Faculty of Canon Law of the Pontifical University Antoniamum; and Prof Paolo Moneta, formerly professor of Canon Law at the University of Pisa. Separately, Cardinal Walter Kasper has said Pope Francis would like to see an ‘opening’ on church teaching on divorced and remarried. In an interview with the international Catholic weekly, The Tablet, the Cardinal said he hopes bishops at October’s synod will listen “to the voice of people who live as divorced and remarried – the sensus fidei. They should listen and then next year they should decide what is possible and what is not possible,” he said. The synod on the family takes place in Rome from 5-19 October. It will be followed by a synod in 2015 where concrete proposals will be put forward. In February this year, Cardinal Kasper was asked by the Pope to address a consistory of cardinals on the subject of the family. In his address, Cardinal Kasper suggested ways that the Church could allow divorced and remarried couples to receive communion while maintaining the indissolubility of marriage. Just this week five cardinals, including Cardinal Gerhard Müller, prefect of the Congregation for the Doctrine of the Faith, have published a jointly authored book expressing their opposition to Cardinal Kasper’s arguments. 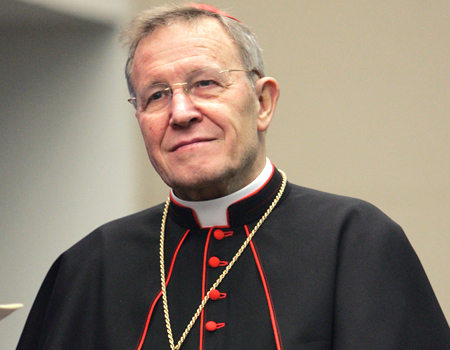 In his Tablet interview, Cardinal Kasper says he has been “a little surprised” by the opposition but stressed he is not undermining the Church’s teaching on marriage. Early on his pontificate, Pope Francis praised the cardinal’s book on mercy (Mercy: The Essence of the Gospel and the Key to Christian Life, Paulist Press).